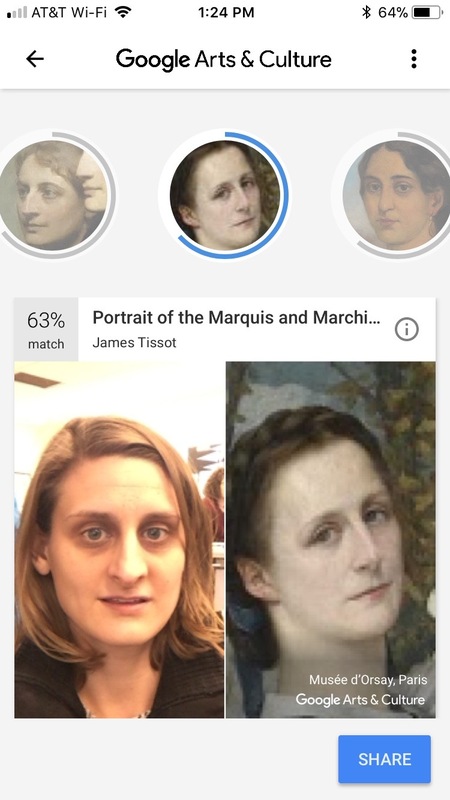 A new feature on the Google Arts and Culture app allows users to take a selfie and then find paintings in museums containing faces like their own. The appeal of a feature like this obvious. Take a selfie (fun), get a light dose of art history (fun), post your pictures on social media to get your friends’ reactions (potentially fun). Naturally, I went for it. And, to be honest, I was hoping for some powerful, interesting women from history to come up. Maybe an abolitionist, or a suffragette. If I got a member of a royal family, maybe it would be a woman who had ruled a country for several years while her husband was ill. Maybe it would be a self-portrait by an artist, who, like me, loved oil paint and painted herself with piercing self-awareness and insight. Fortunately, the app loads quickly, so I didn’t have time to dream up any more ideas before reality set in. It turns out that my two top results (and I did try multiple selfies in an attempt to game the system) are Clara Stillman and the Marchioness of Miramon. Who were these women? The Marchioness’ first name was Therese. She was a French aristocrat living in the nineteenth century with two children, some fancy dresses, and a lovely chateau. I’m sure she was also a complex and interesting individual, but I couldn’t find much evidence for that. Best I can tell, she was just a wealthy woman whom James Tissot painted beautifully. On to Clara Stillman. Clara lived during the same period as Therese, but she was an American living north of New York City in Cornwall on Hudson. She was the sister of the financier James Stillman, and of Bessie Stillman, who is standing in front of her in this painting by Abbott H. Thayer. Not much is known about either of the sisters, although some sources say that one of them was ill at the time of the painting. Not terribly interesting results, but they reflect the reality of what we see in many museums: pictures of wealthy Europeans and European-Americans who could afford to ensure that their faces would not be forgotten by history. My actual historical doppelganger was probably less moneyed and carried my likeness through her ordinary life silently, never having the means to become immortalized. 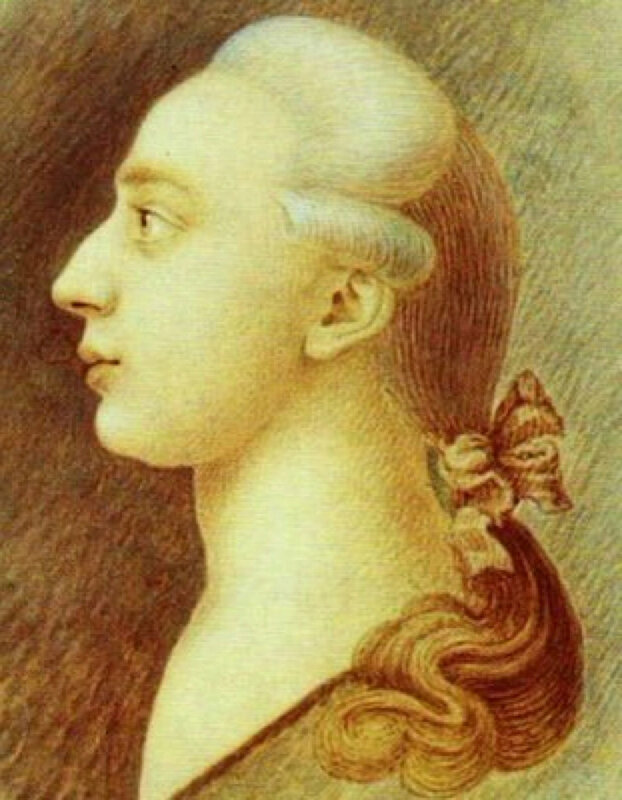 In fact, there’s a chance my historical doppelganger didn’t own a mirror and wouldn’t recognize me as carrying her likeness even if we were to meet. The level of familiarity we have with our faces today is something of a historical oddity. Still, I got a convincing result, and both Clara and Therese do look a little bit like me. But what if I weren’t white? What if I were among the many people of color who have used the app and discovered that the algorithm can’t really find anyone who looks like them. Some people have suggested that the app itself is racist, but that doesn’t get to the core of the issue. The reason the app can’t find a convincing museum doppelganger for many people of color is that museums don’t have diverse images of people in their collections. No algorithm can find something that isn’t there to be found, and so some users have found that their “closest” match is a face that barely resembles their own. Thinking about all this takes me back to one of my first experiences with a doppelganger. When I was about eight or nine, I looked like a sandy-haired Anne Frank, and the likeness was significant enough that people used to remark on it. I grew up in Holland, Michigan, which has a large Dutch population and many people who look very like each other. So, when one of my childhood friends said to me, “You know, you don’t look Dutch. You look like Anne Frank,” I didn’t know how to react. I already knew that I looked like Anne Frank; what I was confused by was the fact that my friend didn’t know Anne Frank was from Amsterdam and thus much more Dutch than either one of us. It was only later, when my orthodontist encouraged me to get my nose fixed sooner rather than later (as if leaving it in its current, vaguely Jewish-looking state was out of the question), that I realized what she meant. I didn’t look Dutch to her because I didn’t look stereotypically Dutch. I looked just a little bit other. Most people have heard some version of, “You don’t look like…” at some point in their lives. Maybe it was, “You don’t look like a cheerleader.” Or, “You don’t look like you’d be good at math.” Or, “You don’t look like you’re from here.” There’s a sense in which all of us walk around applying algorithms to the people we see and making judgments. We see people who don’t look presidential or who don’t look nice or don’t look reliable - as if these things could be written on a face. It’s fun to look at faces of the past and think about who we might have been, but it’s more important, I think, to look at people today and reignite our curiosity about who they might become. Which one of my students is going to be a novelist? A lead parent? A politician? A homemaker? A journalist? A physicist? Recognizing that I don’t know the answer to these questions lifts a bit of a burden from me, and, I hope, allows me to actually see them and not just the stories that my culture has taught me to read in their faces.